Difficult as it was to get cotton to market, it was more difficult to bring supplies back in early Alabama. Until 1816, goods shipped from New York and Philadelphia were sent via Charleston or Savannah, then transported to Augusta. At that point they were carried on the Georgia Road through the Cherokee Indian county to Ross’s landing which was opposite the present day city of Chattanooga. 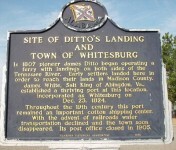 In Chattanooga, supplies were floated down to Ditto’s landing near Huntsville and other points. 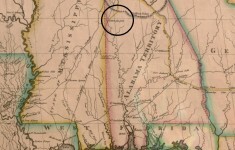 It wasn’t until 1816 that a merchant named Crump managed to bring goods from Mobile to Huntsville by poling them up the river in a boat to Tuscaloosa, and then hauling them in wagons to Huntsville. It took him eight days to finish the journey overland. 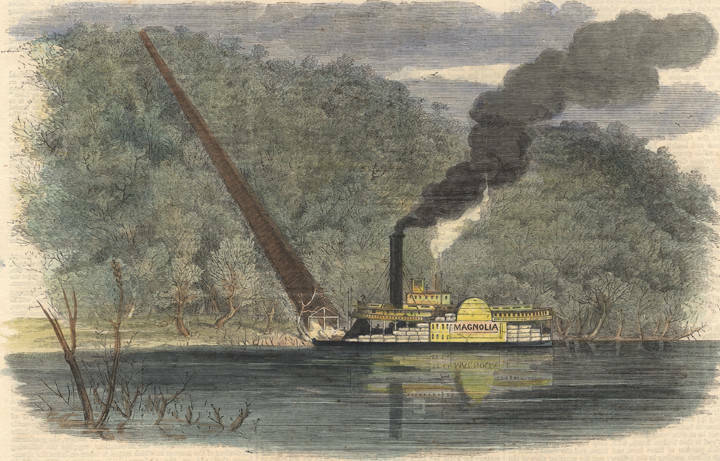 Another route for goods from Virginia was by way of Knoxville, but the most popular route during the 1820s was down the Ohio River to the Cumberland, then up the Cumberland to Nashville. Once the goods reached Nashville, they were taken by land. Flour, pork and whisky from Kentucky and manufactured items from Philadelphia were often brought to Alabama this way. Life changed radically for citizens when the steamboat appeared in the State of Alabama and goods could be carried up stream as easily as downstream. Mobile generally provided supplies for central and southern Alabama while the northern part of the state acquired their supplies from New Orleans. Planters were now able to buy their goods at the same market where they sold their cotton. Two more companies were incorporated in 1820, and a few little steamboats began to appear on the larger rivers of the State. They were a great deal better than flat-boats, and could run up stream five times as fast. Even with that speed, it still required two weeks for the steamboat of 1820 to travel from Mobile to Montgomery. 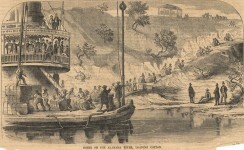 Dr. Wyman told the story of the first steamboat to ascend the Warrior River to Tuscaloosa in the American Mirror, the first newspaper published in Tuscaloosa, The Cotton Plant, with S. Chandler as master. 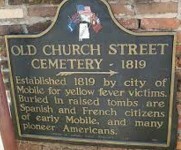 The Cotton Plant left Mobile December 6, 1820 and arrived at Tuscaloosa on December 21, 1821. The return trip to Mobile took nine days. 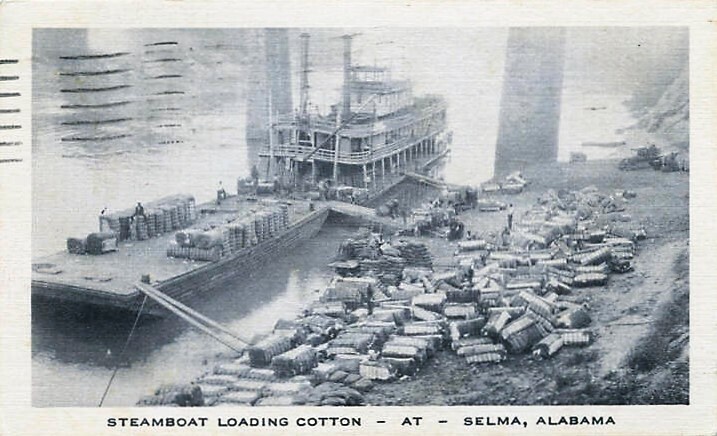 In 1824 the Cotton Plant sank a few yards west of the Tuscaloosa wharf and lay on the bottom of the river until salvaged during the Civil War. Until October, 1821, no steamboat had come up as high as Montgomery on the Alabama River due to the sand bars, islands and narrow channels. 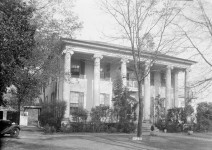 Captain James H. Dearing came to Tuscaloosa on an exploratory trip in 1816 and stayed in a “little shanty of a hotel” kept by Joshua Halbert. The hotel was located close to the site of the old water tower at the north end of Twenty-seventh Avenue. 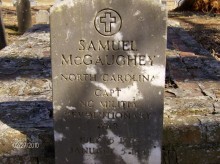 He had served in the United States Army during the War of 1812 and had engaged in merchandise at St. Stephens. He built the second steamboat to reach Tuscaloosa, the Tombigbee, of which he was master and transported his family and goods to Tuscaloosa from St. Stephens. Dearing built the Tombigbee at Blakeley around 1822. 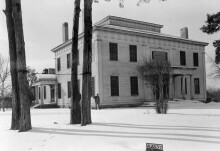 His log storehouse was built on lot number 165, the present site of the City National Bank. He engaged in agriculture and in the operation of steamboats and steam-mills. Sometimes he commanded his own boats. In 1821, a steamboat finally reached Florence in Limestone County, Alabama. The next year the Rocket, was commissioned to run between Florence and the mouth of the Tennessee River. She deposited her cargo at Trinity where it was forwarded up the Ohio or down the Mississippi in larger vessels. On the 16th of August 1822, the Cotton Plant with Captain Chandler as commander arrived at Montgomery from Mobile with a large cargo. She was the third boat to reach Montgomery. By 1824, the Cotton Plant made her way up the Tombigbee to the head of navigation at Cotton Gin Port, Mississippi. The number of steamboats increased each year. Other early steamboats were the Osage commanded by Captain Bond which arrived in Montgomery on the January 22, 1823; the Elizabeth arrived in Montgomery on the 16th of the same month; the Arkansas made a trip from Mobile to Cahaba in six days; and the Columbus,shich arrived on the 1st of January 1824 in Montgomery from Mobile in seven days. There were eleven steamboats in 1823 and by 1826, there were eighteen. Transportation of cotton was the highest priority so it was piled high on the decks while passengers were confined closely to the less than commodious cabins on the early steamboats. 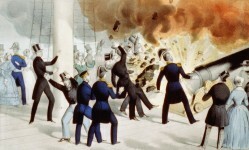 Since steamboats of this day did not have whistles, a gun was fired from the deck to announce the steamboat’s arrival as they approached a town. Since most of the banks along the rivers were steep and high, cotton was loaded by sliding it down an inclined plane. The long cotton chute at Claiborne efficiently conveyed 500-pound bales of raw cotton rapidly to flatboats at first, then steamboats. Since it was necessary for the boats to take on wood, they always stopped overnight because there was a great danger of hitting snags in the tortuous streams at night. Still, accidents did happened and the sinking of steamboats occurred. Twice within the same season the Cotton Plant succumbed to that fate, but each time she was raised and continued her journey. For several years after the appearance of steamboats, flatboats were still used to float their goods downstream while the steamboats did all of the upstream business. Flat boatmen would sell their boats for anything they could get for them and return home as deck passengers on the steamers. Gradually, however, the steamboats increased in number and in speed until they were able to absorb the entire commercial transportation. Keel boats died a permanent death while the keel boatman usually became a deck hand, a mate or a pilot on the steamer. 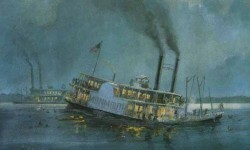 Before steamboats, a barge trip from Mobile to Montgomery usually took from fifty to seventy days. With the advent of steamboats, life for the people of towns along the rivers of Alabama began to rely upon the quick transportation for dry-goods, groceries, hardware and stationery. 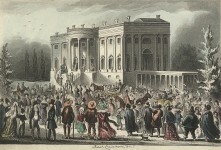 The citizens of the new State of Alabama were growing prosperous and ladies were able to obtain new gowns, while gentlemen were able to purchase new coats. 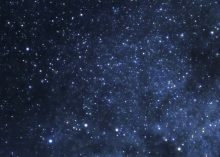 And I used to think the drive from Mobile to Montgomery took forever… It is good to go back and read how our ancestors had to wait for supplies and resolve to practice a little patience in our lives. 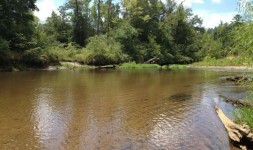 There were many steamboats on the Chattahoochee with a boat landing on the property I now own in southeast Alabama. Very interesting history. Love these articles.